Things have gone from bad to worse for the town of Haven: Croatoan (William Shatner) was reunited with his daughter Audrey (Emily Rose), only to threaten all of her loved ones with special "gifts" following her failed escape attempt. Last week's episode made good on this promise in its final minutes, as Dwight (Adam Copeland) was haunted by the seeming return of his daughter from the dead.. Meanwhile, Nathan (Lucas Bryant) did his best to get through to former frenemy Duke (Eric Balfour), but Croatoan's control proved too strong, allowing Duke to eventually escape (along with a complete census of all the troubles in town.) And Vince (Richard Donat) chose to sacrifice his life for the town by taking the place of Agent Howard (Maurice Dean Wint) as the controller of the barn. With more threats looming, we spoke to executive producers Gabrielle Stanton and Matt McGuinness about what's coming in the Syfy drama's last two hours. What will Croatoan's "gifts" to the rest of Audrey's frinds look like? Stanton: What Croatoan is trying to do is give everyone everyone exactly what they want, their greatest heart's desire. With Dwight, it was obviously his daughter Lizzie; he has been devastated by her death for years and that's really shaped his character. The question is, "Well, what are Duke and Nathan's most heartfelt missions?" I think you'll see in the finale that what Croatoan comes up with for Nathan is something that you would never have expected and is horribly broken. McGuinness: He's giving those gifts not out of the goodness of his heart necessarily, but he's doing it because he's trying to win back the favor of his daughter. [Croatoan] knows that his daughter cares deeply for these people. When he says, "I'm going to give them gifts," he's doing it, but really the person that he wants to be impressed by this is Audrey Parker. Croatoan knows that Audrey cares about Nathan. So what does that mean for him? Stanton: Well, that puts Nathan in a very dangerous position. [Croatoan] knows exactly how to get to Audrey's heart, through her love for her friends and for Nathan. She's very vulnerable when it comes to them and Audrey enters the finale very aware of that and pretty much terrified of exactly what Croatoan plans for them. McGuinness: [Also] we know that Nathan is deeply in love with Audrey, but I think we're going to see how deep his love for Audrey Parker has run. Stanton: We’re going to see the culmination of everything that he's been doing and we're going to learn a lot more about how Croatoan is controlling him and how much control Duke has over what he's doing, [as well as] a lot of the terrible things that Croatoan is forcing Duke to do. Considering he knows her weakness, does Audrey have any sense of what Croatoan's weakness might be? Stanton: She does not yet. But over the finale she does come to realize what his weakness is and she plays on that in a big way. She knows physically they can't beat him. It really comes down to a psychological game that they're all going to end up playing. How is Dwight dealing with seeing his daughter again? It is his daughter, right? Stanton: Well, that's a good question. Is it his daughter? McGuinness: It isn’t really his daughter… But for all intents and purposes it is. That's what Dwight is wrestling with. I think deep in his heart of hearts Dwight knows that it's not his daughter, but she behaves so much like his daughter. She's such a believable facsimile of a daughter that he misses so dearly that he's really troubled. Croatoan knows what buttons to push on Dwight and he pushes them and it almost works. It's interesting, because it's what Croatoan himself might possibly be feeling with Audrey/Mara. Stanton: Absolutely. In fact he'll use that argument with Dwight. "I'm giving you a second chance. That is a very rare and special thing to have your daughter back, to have your family full again." That's basically what Croatoan is trying to do with Audrey. Audrey's always solved problems by talking to troubled people. Is there any way for Audrey to actually talk to Croatoan? He seems quite stubborn. Stanton: Clearly, like any good father, he's probably very stubborn, but in these last two episodes Audrey and her father are going to have the opportunity to have some real heart to hearts and dig deep into what they're both looking for and where their conflicts lie. What does becoming the controller crystal now mean for Vince? Has he changed? McGuinness: Now he can understand a new language and speak a new language that certainly he was never able to speak or communicate in before, but he's still the Vince that we know and love. Can he appear without the crystal being there? Does he have control over it? Stanton: Yeah. When you have the crystal you can call him by saying his name and then he arrives. [But] he doesn't [have control over it] and he's not sure if he does. That's what really worries him in the finale. Dwight's going to learn exactly what the price for Lizzie sticking around is. Croatoan wants something and Vince is going to be very worried that he's going to be caught up in this decision that Dwight has to make: keeping Lizzie or helping Croatoan do what he wants. What does Croatoan want? Now that he has Audrey and he's trying to convince her to love him again, does he have a greater goal beyond that? MM: He has a business plan, which is to return to where they came from and to continue their experiments with aether and to make people see that what he was doing was great. On an emotional level, he wants to return with his daughter. He wants to restore the family unit and he wants to have her be proud of him and carry on the legacy. There seems to be a lot of big dad issues over the course of this show. Stanton: We enjoy dad issues. We put dad issues all through the series, almost every season, I think. 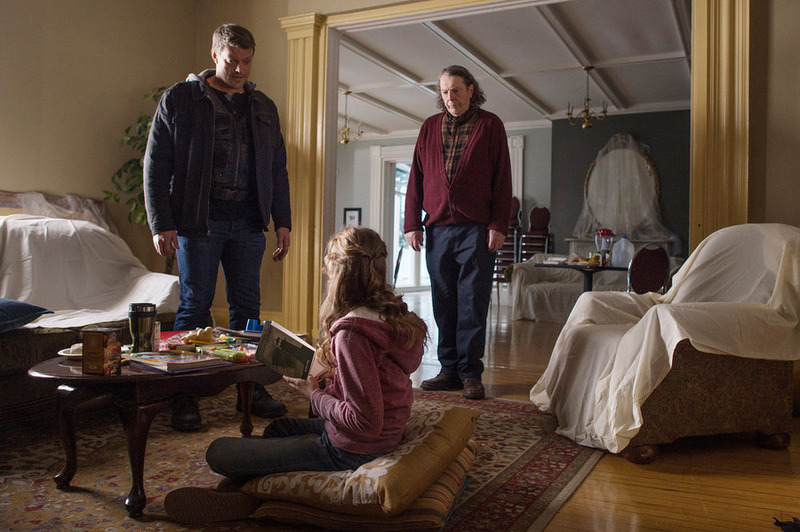 The Haven series finale airs Thursday at 10/9c on Syfy.